Computational modeling has enabled accelerated the assessment of engineering design alternatives. At the same time, the increasing complexity of such models and the required multidisciplinary analyses has maintained, if not increased, numerical challenges such as the unavailability of gradients (or unreliable approximations thereof), prohibitive computational cost, and even the models’ occasional failure to return a value in unexplored areas of the design space. In addition, coordination techniques are required to account for system interactions when the design problem has been decomposed to address computational issues related to dimensionality and/or convergence. In this talk, we will present methods, algorithms, techniques and strategies developed to alleviate the issues discussed above. We will discuss the use of derivative-free optimization and surrogate modeling, emphasizing the need for appropriate strategies and rigorous algorithms with convergence properties. 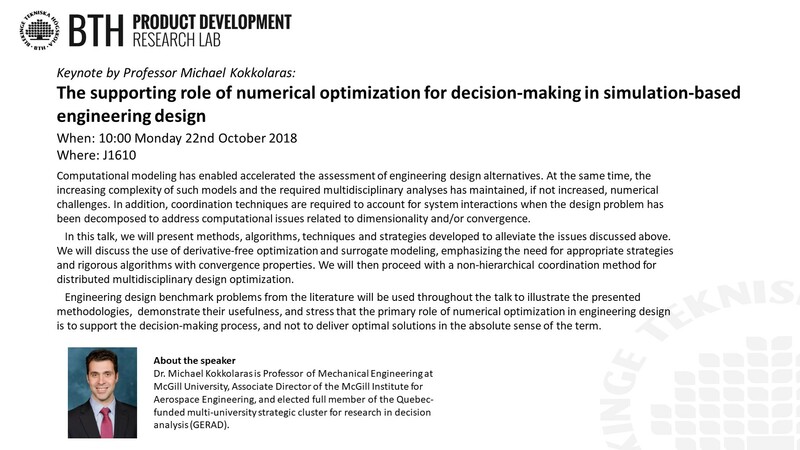 We will then proceed with a non-hierarchical coordination method for distributed multidisciplinary design optimization. 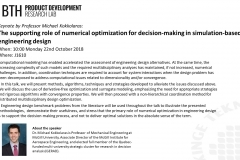 Engineering design benchmark problems from the literature will be used throughout the talk to illustrate the presented methodologies, demonstrate their usefulness, and stress that the primary role of numerical optimization in engineering design is to support the decision-making process, and not to deliver optimal solutions in the absolute sense of the term. Dr. Michael Kokkolaras is Professor of Mechanical Engineering (at the associate rank) at McGill University, Associate Director of the McGill Institute for Aerospace Engineering, and elected full member of the Quebec-funded multi-university strategic cluster for research in decision analysis (GERAD). He holds a Diploma in Aerospace Engineering from the Technical University of Munich and a Ph.D. in Mechanical Engineering from Rice University. His research interests include multidisciplinary optimization, simulation-based engineering design, uncertainty quantification, surrogate modeling and validation, product-service systems, and optimization applications in engineering. He has co-authored 57 articles and 2 editorials in peer-reviewed journals, 68 papers in conference proceedings, and 5 book chapters, and has given more than 40 invited talks at academic, industry and government seminars and workshops. He served as Associate Editor of the ASME Journal of Mechanical Design from 2008 to 2014, Optimization and Engineering (Springer) from 2013 to 2018, and currently Structural and Multidisciplinary Optimization (Springer). He was elected to serve on the 5-member ASME Design Automation Executive Committee (Design Engineering Division) from 2013 to 2018, and the AIAA Multidisciplinary Design Optimization Technical Committee since 2006. Dr. Kokkolaras was elected Associate Fellow of the AIAA in the class of 2014.